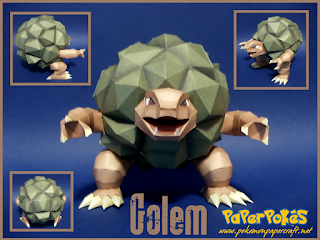 Interesting Facts: Golem's brownish-colored body resembles a boulder as it is covered by a layer of plated rocks. Golem has a head protruding out of the center of the shell, with short arms that have three claws and four-clawed legs. Unlike its previous forms, it has red eyes and its face appears much less 'rocky' and craggy in appearance, instead being somewhat turtle-like with two visible teeth in the lower jaw. As shown in the Pocket Monsters Carddass Trading Cards Golem's shell is hollow. NOTES: Follow the numbers, being careful with the appendages (arms, head, legs). Notes included.